High performance blenders designed for beverage preparation. Wave~Action™ system continually forces mixture down into the blades. 3 Hp motor with all-metal drive coupling. Jar pad sensor helps prevent "wear & tear". 2 speeds, jump cycle & pulse button. Stackable 64 oz. polycarbonate container. USB port for future program updates (Summit Blender). Quiet Shield™ sound enclosure (Summit Blender). 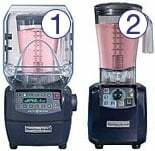 Auto Blend "One-Touch Sensor Blending" (Summit Blender).